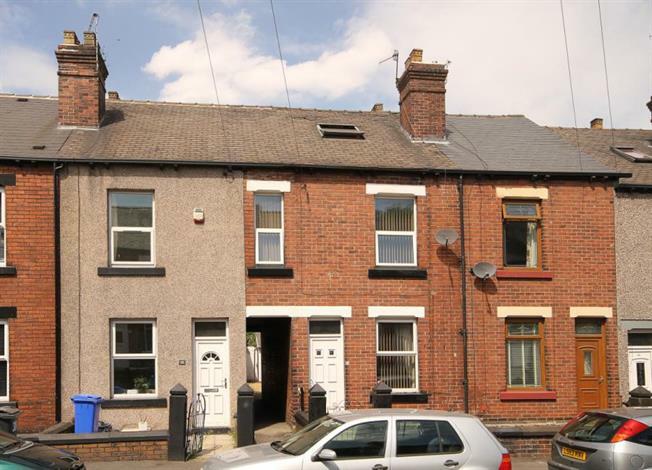 A deceptively well proportioned three bedroom period terrace house. Located within highly regarded residential area convenient for access to Sheffield City Centre, universities and hospitals making the area very popular with young professionals, families and first time buyers. Served by a comprehensive range of excellent local amenities including health and fitness centres, supermarkets and regular public transport. The property offers extensive versatile living accommodation over three floors. The front entrance door provides access to the light and airy principal reception room. Inner lobby through to the open plan fitted dining kitchen with a comprehensive range of units. Cellar and garden access from the kitchen. The first floor accommodation provides two large bedrooms and a modern family bathroom with bathroom. On the second floor is a substantial third bedroom. Maintained forecourt garden area, side passage access past the property to the rear with gardens and external outbuilding. Only from a detailed inspection can the full extent of accommodation on offer be fully appreciated.